Having been introduced to psychotherapy by psychoanalysts and, to a lesser extent, behaviorists (cognitive therapy had not yet caught on), I was very impressed when a friend of mine first introduced me to family systems theory. It taught me about the importance of feedback in interpersonal interactions. The actions of person A in a relationship do not "cause" the actions of Person B in response. Both A and B are continually affecting each other's behavior simultaneously, as each person assesses the motives and intentions of the other. A relationship evolves over the the entire time the relationship between two people exists. People are not rats; they do not just respond to what the other persons just did, but to what they just did in relationship to everything else they have done during the history of the relationship. Additionally, we are not robotic automatons, even though most of what we do most of the time is just responding to the usual environmental cues. It is estimated by neuroscientists that about 80% of what we do during our day involves no conscious deliberation whatsoever. However, if something unexpected happens as we do that, we will then think about it. 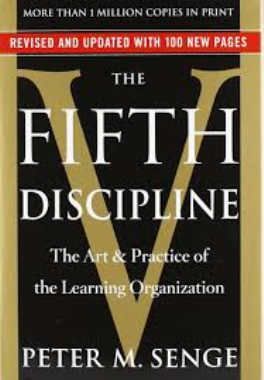 Systems thinking is one of the main themes of Peter M. Senge's best-selling book, The Fifth Discipline, first published in 1990. The book discusses common errors business people make because of a lack of appreciation of feedback effects that take a certain amount of time before those effects become apparent. The most common examples are described using something that he calls Systems Archetypes. Understanding them is not just important in business but in all human interactions, including within family systems. He lists ten of them. In this post, I would like to summarize just three that I think are the most relevant to the subject matter covered in this blog. Perhaps the most famous of the archetypes is one Senge calls Shifting the Burden to the Intervener. It is the one described by the common proverb about teaching people to fish rather than giving them a fish. When a person or a group of persons is having some sort of problem that they cannot solve, they often call upon a consultant who does not tell them about general aspects of how to solve certain types of problems, but actually steps in and solves the problem. The next time a problem arises, the consultant is brought back to solve it. The long-term result is that the original group never learns to, or is not motivated to, solve similar problem themselves. This is the nasty side effect created by so-called helicopter parenting. Another systems archetype is far less widely known. Senge calls it Success to the Successful. I mentioned a good example of it in my last post. It is seen in students who do poorly in school who then get diagnosed with some psychiatric disorder. The basic pattern is that kids in a classroom are somewhat in competition for the teacher's attention and praise. The kids who start out as attentive and well-behaved gain praise and positive attention from the teacher, while the ones who do not start out that way are seen as undeserving of praise. The teacher's negative attitude toward the latter children is observed by these students, who then start to see themselves in a negative light. Due to their loss of self confidence, they start to put even less effort into their schoolwork, which then feeds back into the teacher's negative view of them, which leads them to become even more discouraged, and so on. This archetype is the basis of many a case of what is commonly referred to a "self-fulfilling prophecy." The third archetype I will mention is called Balancing Process with Delay. This occurs when a group or individual overcompensates for something in one way or another because there is a significant delay between what they have started to do and its effects. An illustrative example many of us are familiar with is a shower in which the temperature of the water responds sluggishly to changes in faucet position. Because the water seems to stay cold, a poor guy in the shower turns up the temperature, but nothing much seems to happen. The delay is due to the distance of the faucet from the hot water heater. So he turns it up again. If he keeps doing that, he suddenly finds himself getting burned due to a large, sudden and unexpected rise in the water temperature. Because of delays in business, shortages of something can suddenly turn into a glut of that product, which then leads to another shortage as producers react too quickly to market conditions. In families, this may be seen in parents who had been abused as children. They try to be unlike their own parents by going to the opposite extreme and letting their child get away with murder. 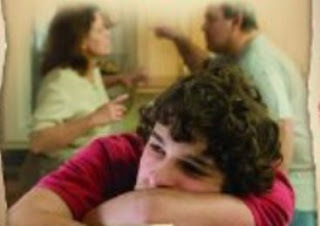 In response, the child starts to feel like the parent does not really care about them, because the parent seems to ignore it if they do something self-destructive like coming home intoxicated or failing in school. When that child grows up and has a child, he or she may overcompensate back in the other direction, and become too harsh! In looking at genograms, we sometimes see entire generations going back and forth between two extremes. A generation of alcoholics begets a generation of teetotalers who beget a generation of alcoholics; a generation of workaholics begets a generation of slackers who beget a generation of workaholics, and the like. One of the recurring themes of this blog is the tendency of mental health researchers and practitioners to look at patients' symptoms without any investigation into the home environment, and decide that they, or their brains, are the entire problem. Psychological problems in kids are roughly divided into externalizing behaviors and internalizing behavior. The former is basically acting out: doing poorly in school, being hyperactive, being oppositional, getting into fights, throwing tantrums and the like. The latter refers to things like anxiety and depression. Either way, today kids who have any of these problems are in danger of being labeled with mental disorders such as ADHD, bipolar disorder, and even "oppositional defiant disorder," which I refer to as "spoiled brat disorder." And of course there is "conduct disorder," which I refer to as "juvenile delinquency." These know-nothing researchers act as if living in a tense or chaotic home environment is good for children's emotional life and that they do not become distractible or agitated under these circumstances. As I have often joked, when it comes to looking at the home environment, most mental health professions will - if they say anything at all - label it as "within normal limits (WNL)." What WNL usually really means is "We never looked." If they do "look," they may ask the parents one or two questions about discipline, and take their answers at face value as well as valid or complete. Or if they really want to pretend they have obtained the whole picture, they can ask the child's teacher what the kid's behavior is like at school. Of course, teachers are likely to have less patience with kids who are distractible, and then have lower expectations of them. The kids will pick up on this, and the teacher's attitude causes these kids to become even more distressed, which makes the teacher have even less patience and lower expectations of them, and so on in a vicious circle. (This long-term process was described by Peter M. Senge in his amazing book, The Fifth Discipline). Researchers in psychiatry, as I described in a post about borderline personality disorder researchers, are even worse than practitioners at ruling out environmental causes as the explanation for symptomatic children. They never even read summaries of the literature produced by developmental psychologists. “Children are like emotional geiger counters,” said E. Mark Cummings, a professor of psychology at the University of Notre Dame who has conducted extensive studies on the effects of marital discord on kids for more than 20 years. Children, he explained, are incredibly attuned to parents’ emotional communication with each other; they’re keenly aware that, for their parents, nonverbal expression is key to communicating feelings. For many couples, holding onto a grudge—smoldering but not letting a disagreement erupt into a fighting match—may seem like the best way to deal with a conflict. But research shows this kind of discord can significantly interfere with a child’s behavior and sense of emotional security. When exposed to prolonged unresolved conflict, kids are more likely to get into fights with their peers at school and show signs of distress, anger, and hostility. They may also have trouble sleeping at night, which can undermine their academic performance. In fact, according to various studies that measured children’s emotional responses to interparental hostility, disengagement and uncooperative discord between couples has shown to increase a child’s risk of psychological problems, including depression, anxiety, social withdrawal, and aggression." Here is the abstract of the study. Notice how the study was longitudinal - meaning it looked at parental behavior and children's reactions to it over an extended period of time - and used multiple measures and multiple observers. Researchers also actually observed the family members interacting with one another while engaged in various conflict resolution tasks. That's what a researcher has to do to in order vastly improve his or her chances to see what is really going on at home and to see what the most important causal factors are for psychological distress in young people. This multistudy article examined the relative strength of mediational pathways involving hostile, disengaged, and uncooperative forms of interparental conflict, children's emotional insecurity, and their externalizing problems across 2 longitudinal studies. Participants in Study 1 consisted of 243 preschool children (M age = 4.60 years) and their parents, whereas Study 2 consisted of 263 adolescents (M age = 12.62 years) and their parents. Both studies utilized multimethod, multi-informant assessment batteries within a longitudinal design with 3 measurement occasions. Across both studies, lagged, autoregressive tests of the mediational paths revealed that interparental hostility was a significantly stronger predictor of the prospective cascade of children's insecurity and externalizing problems than interparental disengagement and low levels of interparental cooperation. Findings further indicated that interparental disengagement was a stronger predictor of the insecurity pathway than was low interparental cooperation for the sample of adolescents in Study 2. Results are discussed in relation to how they inform and advance developmental models of family risk.